The newly designed traffic indicator – From the inventors of the graphic FLARM®-Display. AIR Traffic Display is our newly designed premium display solution for traffic data. It features robust hardware, a sunlight readable display and advanced functionality reducing flightcrew workload and increasing traffic awareness. 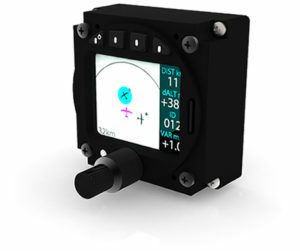 Air Traffic Display works well with many collision avoidance devices like TRX, (Power)FLARM®, or systems with GARMIN® TIS interface. With the “Butterfly Displays” we have introduced the first graphic FLARM® Displays back in 2007. We have used all of our experience and the results of current university research to design a truly new and powerful traffic indicator from scratch. AIR Traffic Display supports pilots and effectively enhances traffic awareness. Its unique user interface helps understanding traffic sitations more precisely and its intuitive warning features provide reliable data for making well founded split-second decisions in hazardous traffic situations.